A team of top shark experts from the U.S. was heading to Egypt Monday to help determine what is behind an unusual series of shark attacks that have killed one tourist, injured four others and cleared Red Sea beaches of swimmers. Shark attacks at Egypt's Red Sea resorts, famed for their reef diving, are rare. The attacks on snorkelers and swimmers over the past week at Sharm el-Sheikh, on the southern tip of the Sinai Peninsula, are believed to involve two oceanic whitetip sharks, which normally do not get close to beaches. The attacks turned fatal on Sunday. A shark tore the arm off an elderly German swimmer, killing her almost immediately. Days earlier a shark badly mauled three Russians and a Ukrainian. Authorities have indefinitely closed the beaches to swimmers and barred anyone from entering the water except for professional divers. Environmentalists have theorized that overfishing and a declining ecosystem could be driving sharks closer to shore in search of food. There are also accusations that tourist boats are illegally dumping meat into the water to attract sharks for passengers wanting to photograph them. The three visiting experts are George Burgess, director of the International Shark Attack File; Marie Levine, head of the Shark Research Institute in Princeton, New Jersey; and Ralph Collier, author of "Shark Attacks of the Twentieth Century." They will give the final word on the causes and also on when it is safe for tourists to return to the water, said Egypt's Chamber of Diving and Watersports. The chamber's chairman, Hesham Gabr, said that based on the patterns of bite marks on the victims' bodies it appeared there were two sharks involved. Before Sunday's fatal attack, authorities believed they had caught and killed the two sharks that mauled the tourists. Gabr questioned the way the sharks were targeted and said he was against "random shark hunting." Gabr said a passing transport ship recently threw dead sheep in the waters and said sharks are sometimes fed from boats carrying tourists out to see them. In the last fatal shark attack in Egypt, a French diver was killed by an oceanic whitetip in the Red Sea in 2009. Sharm el-Sheikh is one of Egypt's main beach resorts, which attract hundreds of thousands of foreign vacationers annually. The spate of attacks could deal a blow the country's tourism industry, a vital source of income. Jochen Van Lysebettens of the Red Sea Diving College in Sharm el-Sheikh said his company had to take customers to other resorts along the Sinai. "We were shocked by the attacks, but cancelations are rare, as we offered alternatives," he said. In Germany, Nina Meyer, spokeswoman for L'Tur tour agency, said the company had no cancellations, but "we've had many customers' calls with questions - can I still swim, what is safe, what isn't." She said that the company canceled all of its boat excursions in the Sharm el-Sheikh area to ensure extra safety. In Britain, two big travel agencies, Thomson and First Choice, advised holidaymakers to stay out of the water. 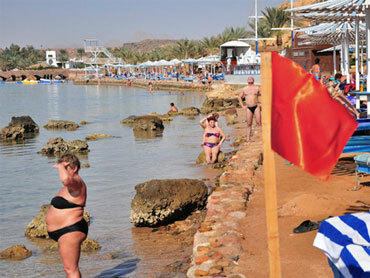 "We are also canceling all water-based excursions in the Sharm el-Sheikh area until further notice," the companies said. Both are part of TUI Travel PLC. Beach tourism is believed to contribute some 66 percent of Egypt's total income from tourism, which is expected to reach $12.3 billion by the end of the current fiscal year in June, Tourism Minister Zohair Garanah was quoted as saying in state-owned Al-Gomhuria daily. In September, the prime minister predicted the country's economy could grow by 6 percent in the current fiscal year, boosted by strong first quarter results in tourism.